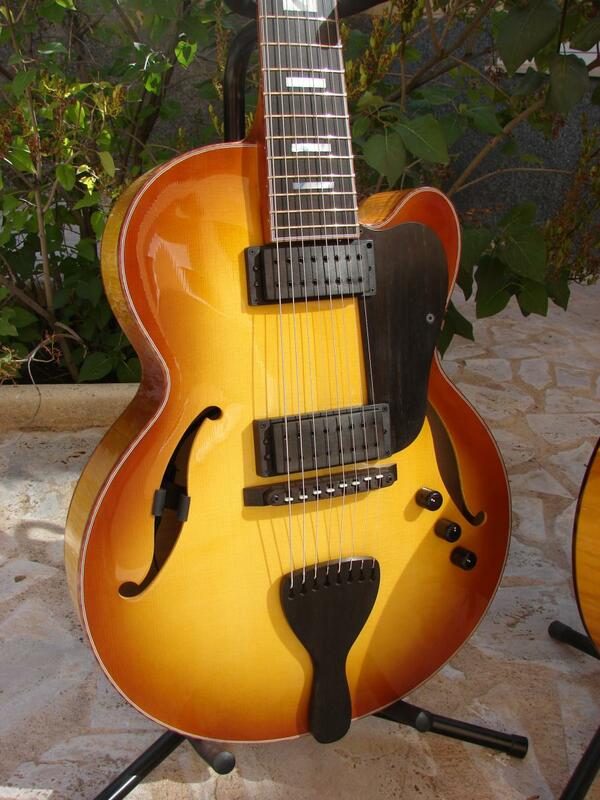 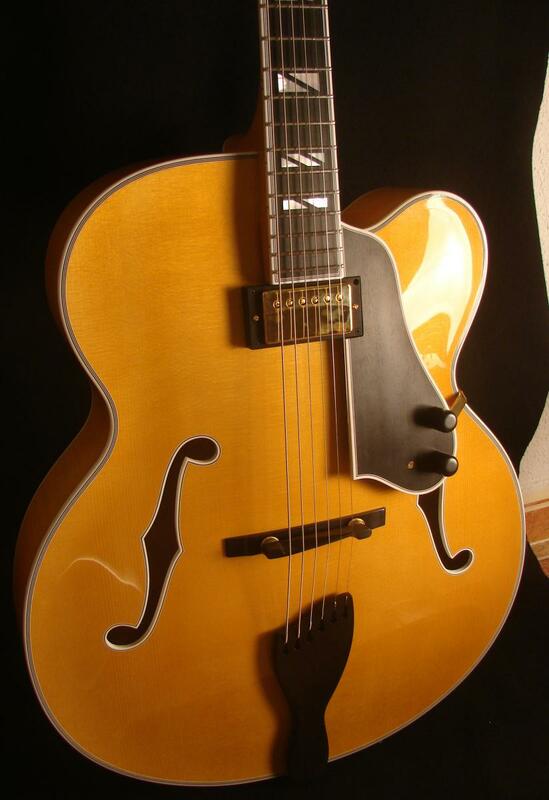 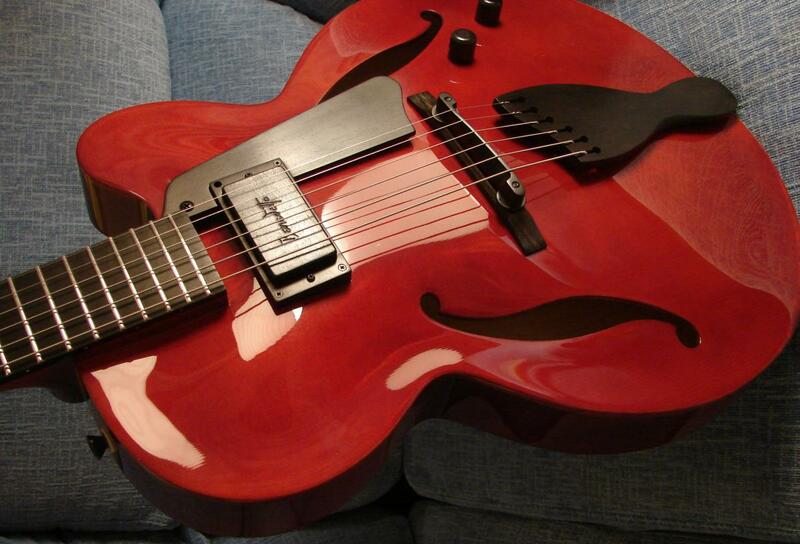 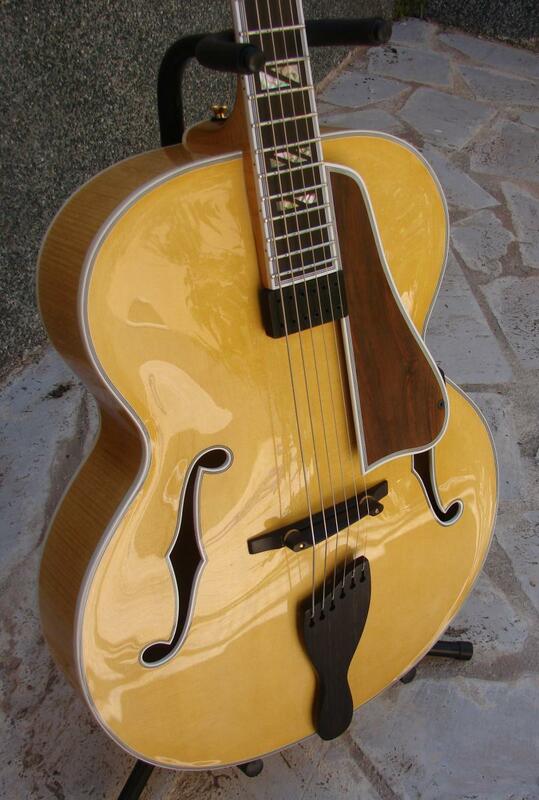 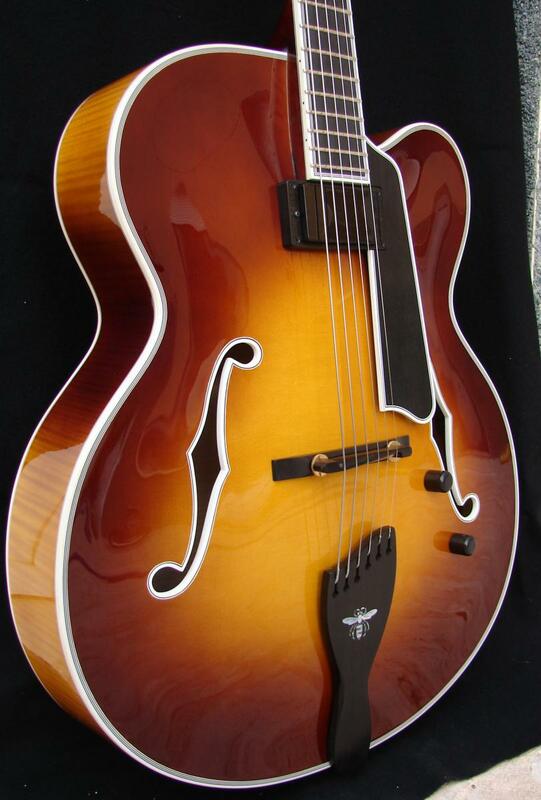 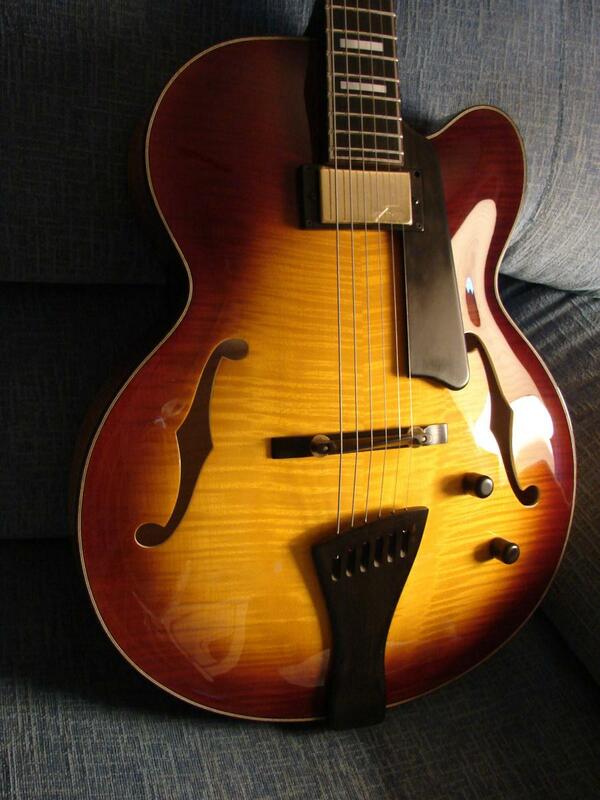 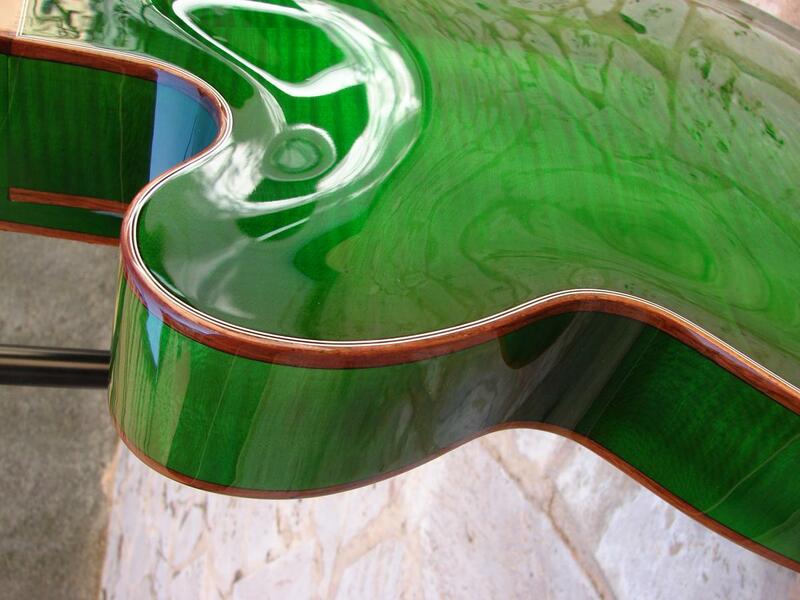 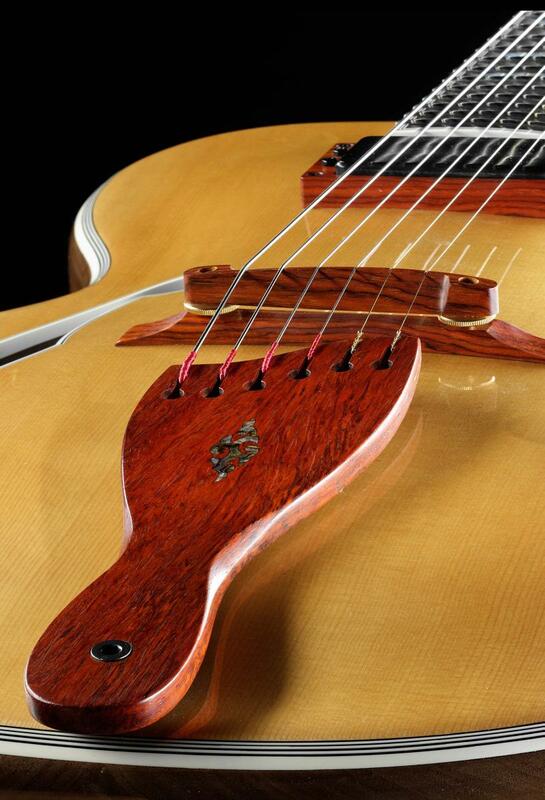 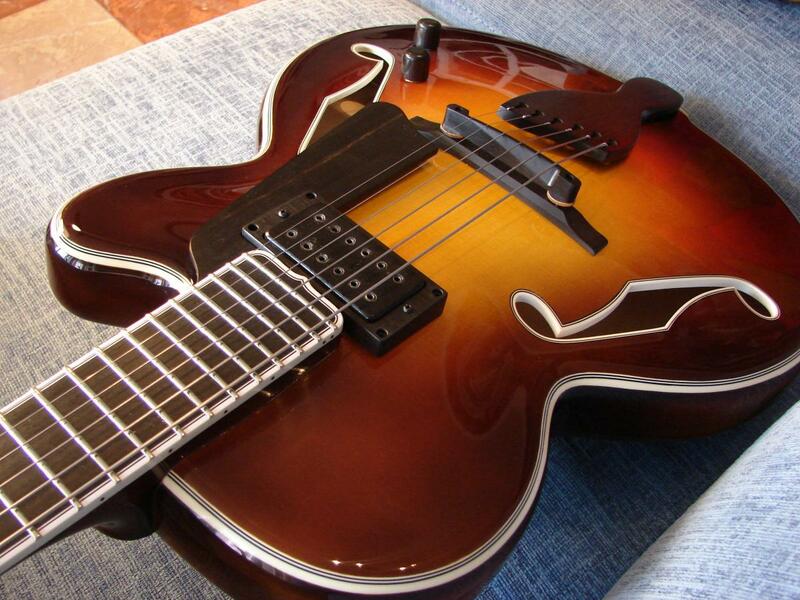 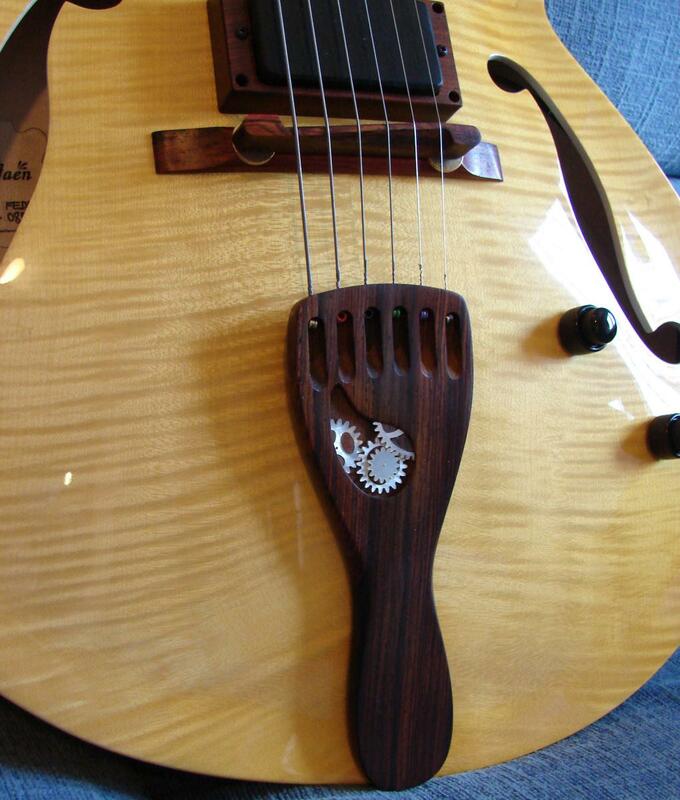 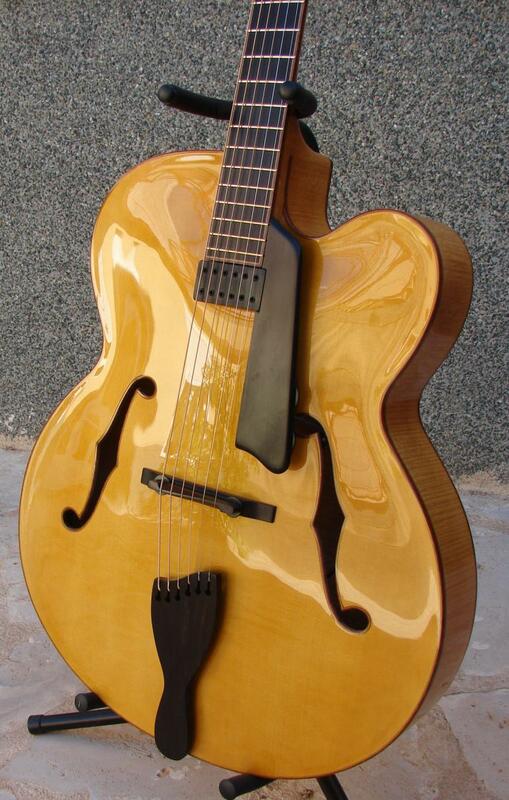 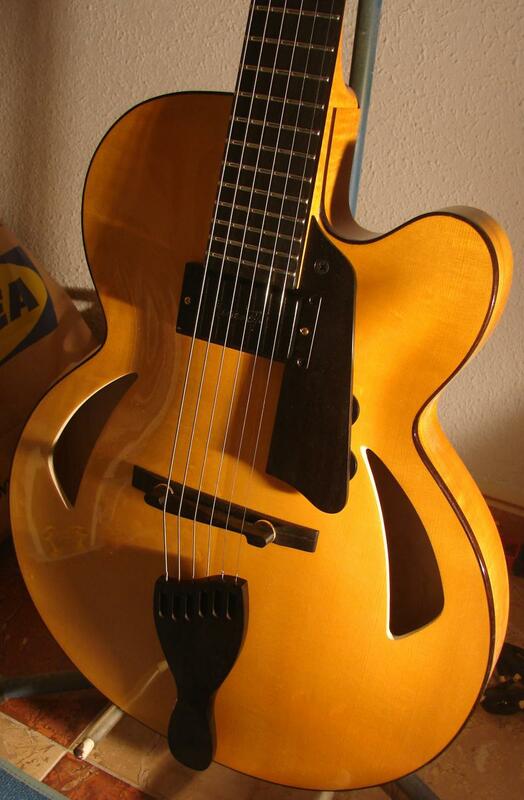 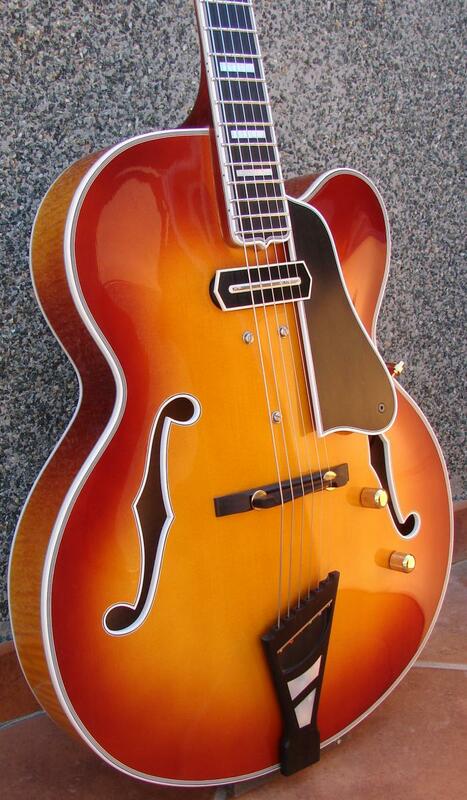 This model has a size of 15 inches, much smaller than usual archtops. 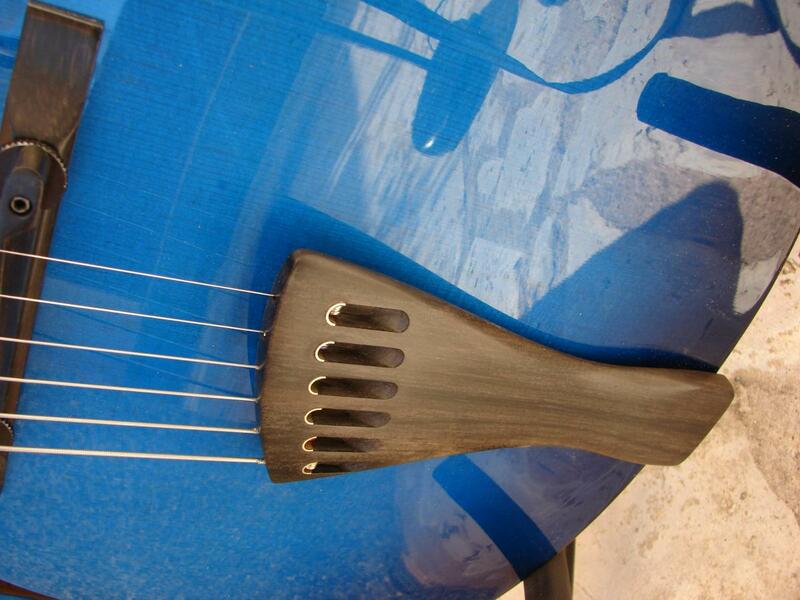 The first Jamaicas had carved solid bodies, with back and sides made from the same piece of wood. 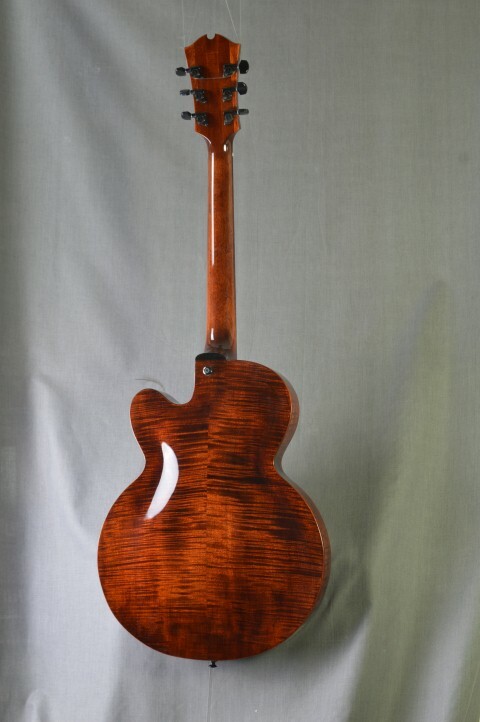 I kept adding options and now, many years later, most of these guitars have a conventional construction with bent sides and carved back; this one is like that. 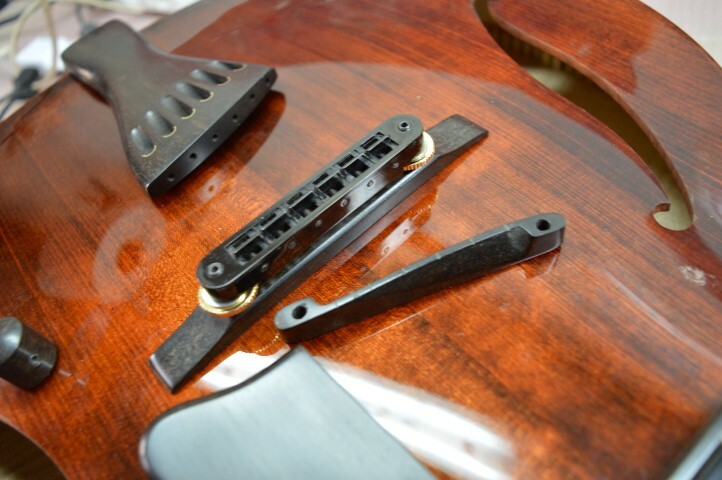 I would also mention the color, which I call “old violin”, in this case applied with more confidence. 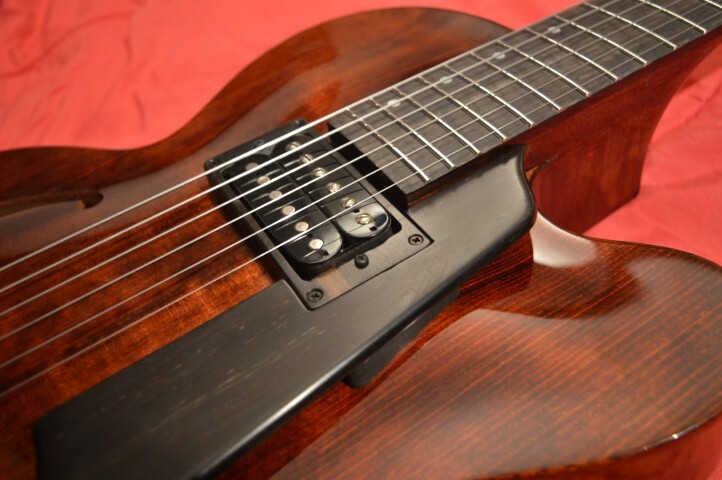 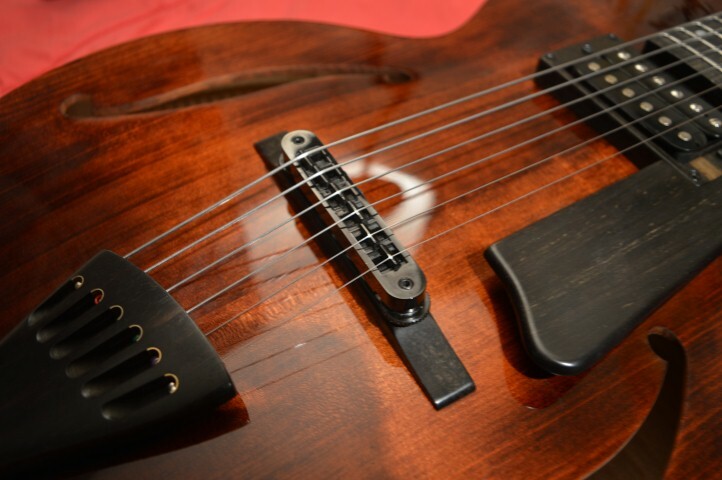 Apart from this, the guitar has an spectacular electric tone, and a good part of it must come from the Lindy Fralin pickup, the brilliant choice of my client. 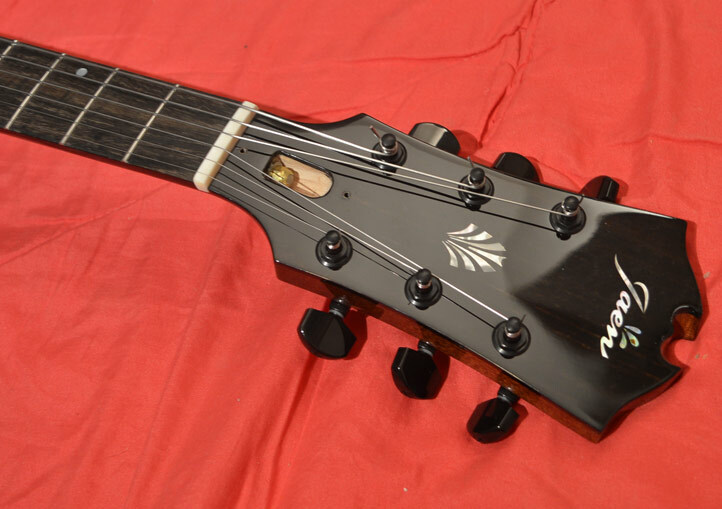 Maple neck, with 25" (635 mm) scale length instead of the more common 25.5". 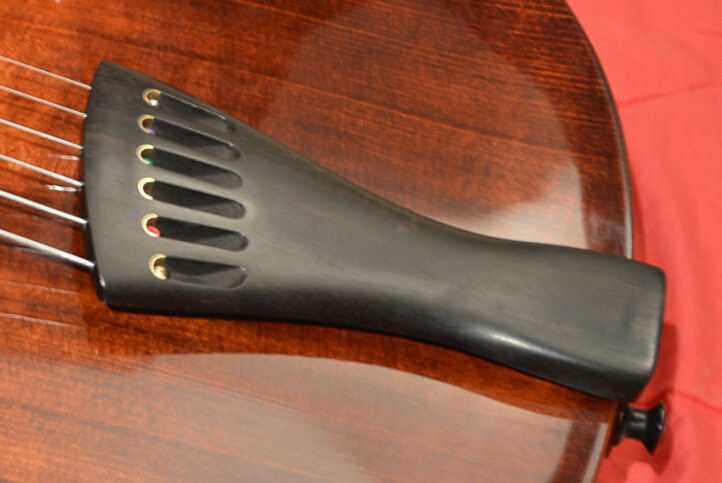 The bone nut has a width of 1 11/16″ (43 mm). 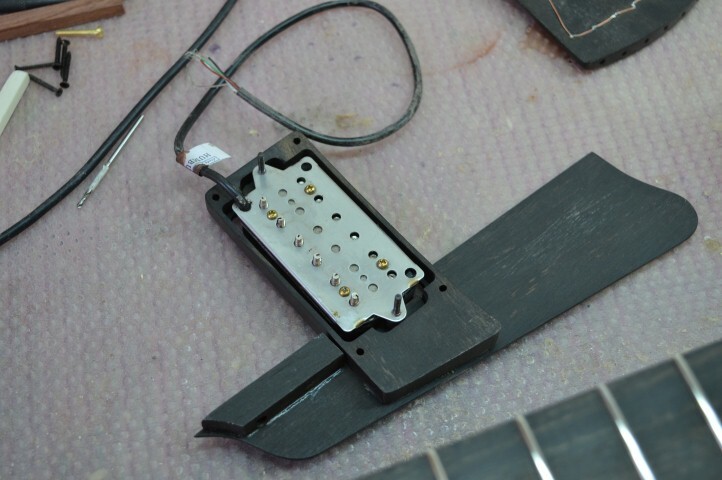 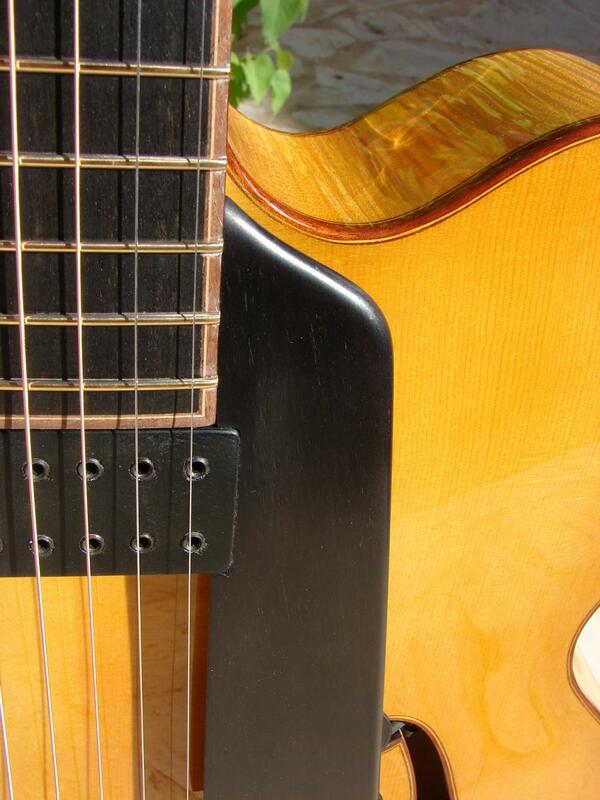 The ebony fretboard is curly (although that is hardly noticeable in this peculiar wood) and it has offset mother-of-pearl dots and stainless steel frets (Jescar FW47104SS). 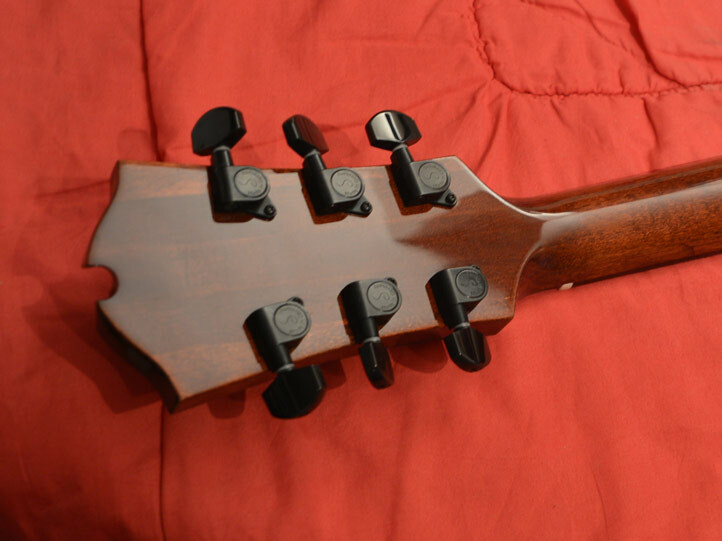 Due to the finish, the bindings are not very noticeable, but they are at the edges of both top and back. 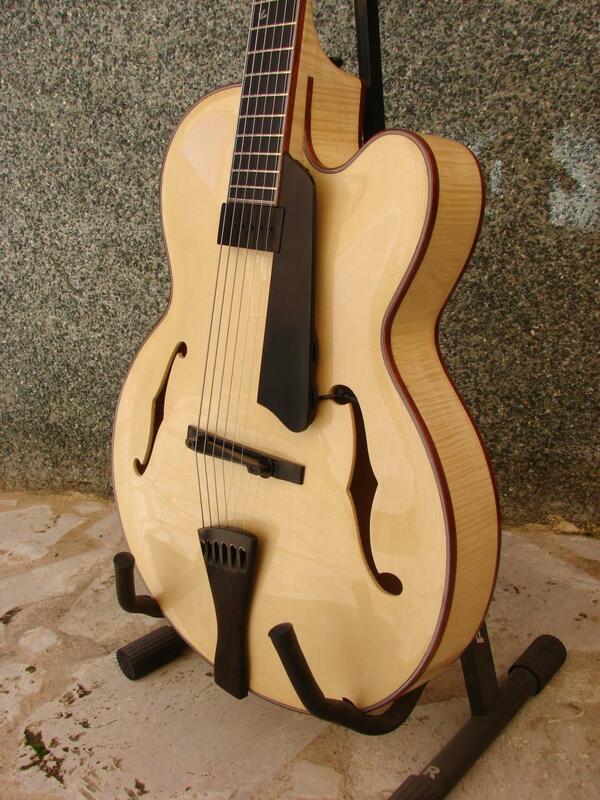 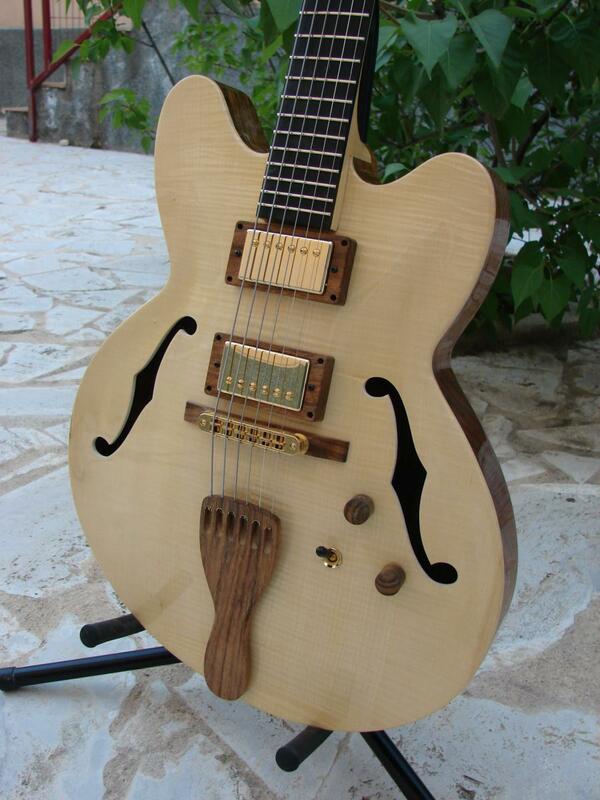 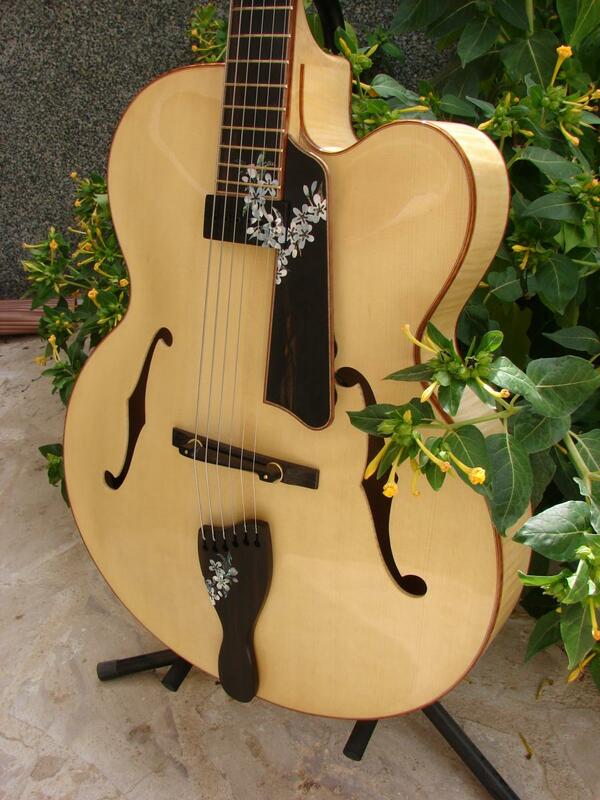 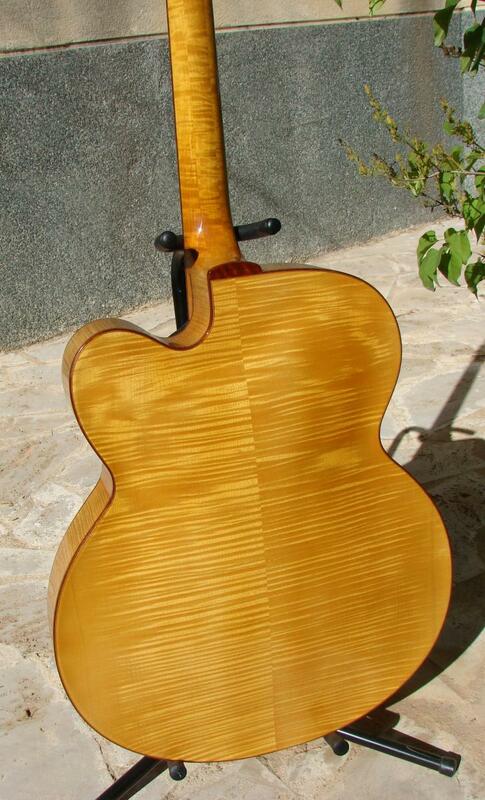 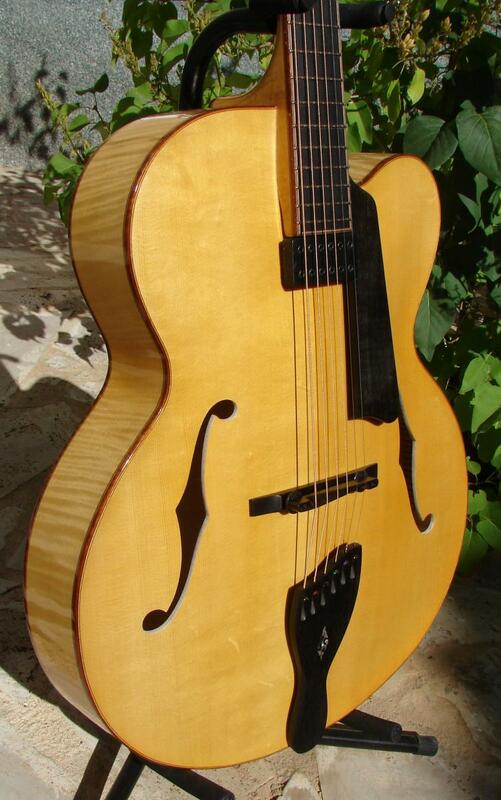 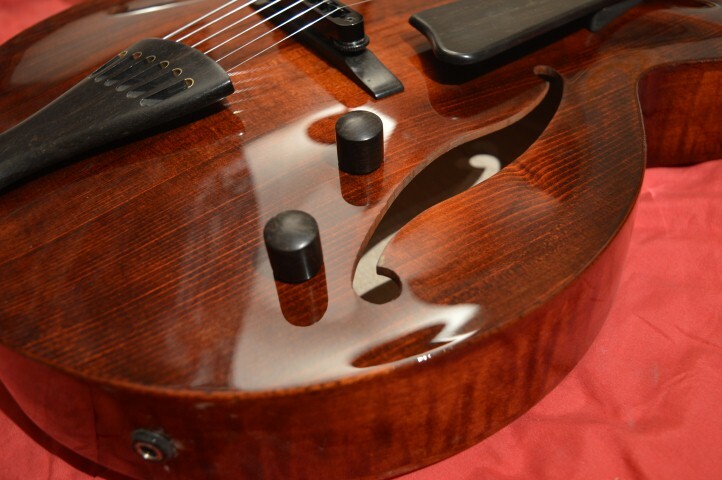 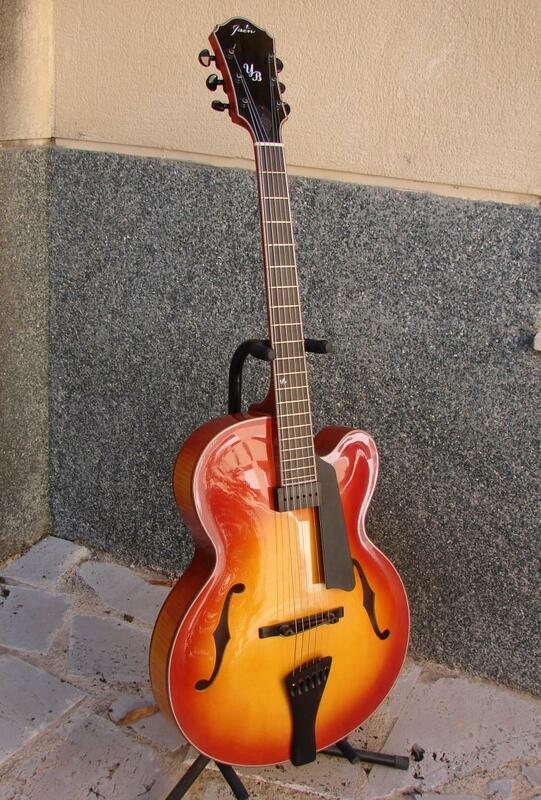 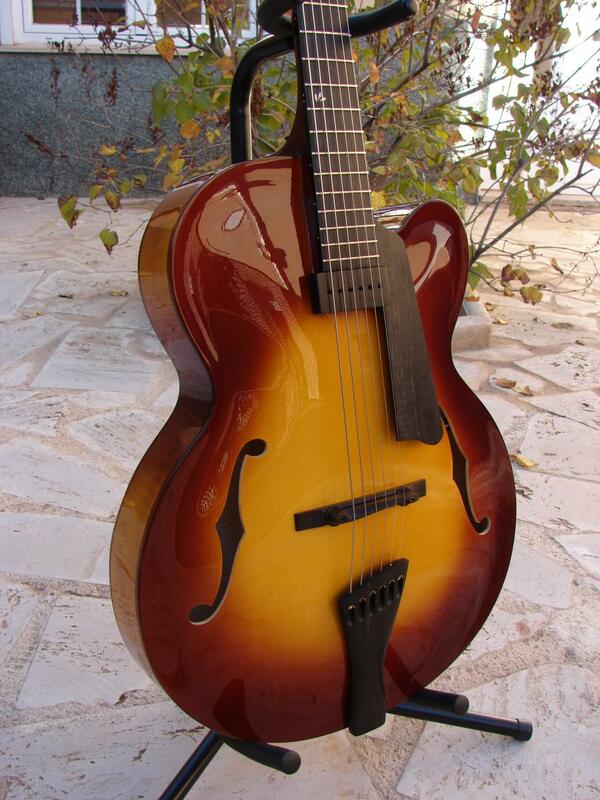 They are made of jatoba, a hard wood, and their purpose is to protect the edges, especially the soft spruce top. 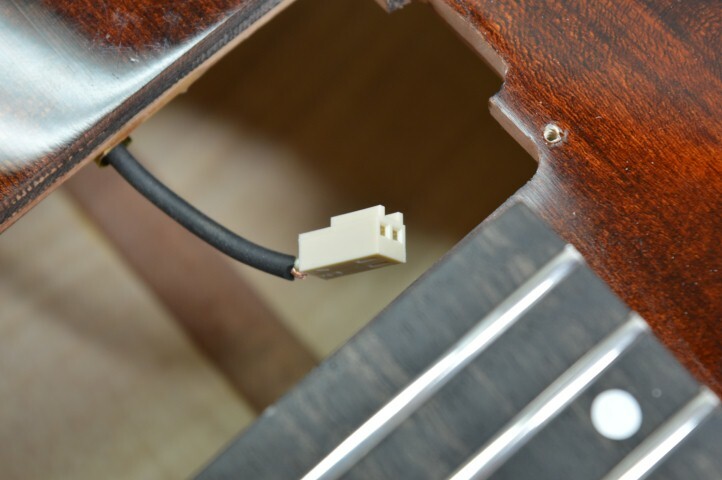 The jack is here, at the side.